Online Free pdf password unlocker tool let you upload your pdf files that are protected by the password and you get a non-protected pdf file. It means that after uploading your pdf file it removes the password from your uploaded pdf file. These tools can be used free of cost and password from a pdf file can be cracked just within few moments. For this purpose, you don't need anything to download and install on your computer because these tools which also called web-apps works within the browser without any installation or registration. So it shows that you can easily remove password from your pdf files in case you've got a pdf file but is protected by a password. One question arises when we talk about using the free online tools for removing password from a pdf file. because you know that you can also make use of desktop software for such work. The answer is clear that the desktop software need time to download and then to install on the computer in order to be usable. Also it takes space from your computer hard drive when you install it on your computer. As a result, your computer performance became slower. On the other hand, if you use online pdf tools, you will no need to download, install anything on your computer. So it saves your time and unlocks pdf efficiently. With using online pdf tools, your system also doesn't affected to work slower. In one case I would like to suggest using the desktop software which is if you have multiple files and are required on regular basis. As we mentioned above, that you can also do it through the desktop software but in this post we will be making use of online tools and in the below list, we will be showing you the method of how you can use the appropriate tool to unlock your pdf file. So to get your answer, please look at the description of the tools listed below, you will find the answer of how to unlock pdf online for free. What Are Owner and Reader Password on PDF? When we talk about password-protected pdf file, there are two types of passwords for securing the pdf file. The pdf file which is secured only from copy paste or for printing. Such a password is called an owner password and this password can be removed easily by the free online tools listed below. But the pdf file which is locked for opening and reading i.e when you click on a pdf file, it asks you to enter a password. This type of password is called user password and it need too hard processing to unlock these passwords, so online tools may not work in this case. You can do it by using the desktop software available to buy or may be found a free tool. Now, let get started with our today's collection of the best and free online password cracker tools for pdf files, with the below tools you will be able to remove any restrictions and passwords from the files that are restricted or secured. What you have to do is to read the description carefully and then open the website I mentioned to get your work done! Within a simple, easy to use and having user-friendly clean and safe interface, this tool let you upload a pdf file which has been locked with an owner password for copy-pasting and printing and remove the protection from it to give you a file without any protection. In addition, this also allow you to un-protect the excel file format. That's it dear readers, I hope you liked our today post and found it helpful. The post was to provide you the list of best free online password cracker tools on pdf files. Don't forget to share this post with your friends on social networks profiles. Thanks matt for coming here and suggesting this tool. I read about it and I think this is really appreciate-able (looking at the description given there). I'd like to suggest this one for removing password from their pdf files. 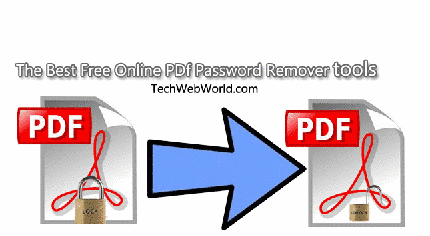 There are so many solutions available for PDF restriction remover, but I have personally read this blog http://pdfutility.blogspot.com/2013/11/use-it-when-you-dont-have-password-of-the-pdf-file.html and know easy steps how to remove all types restrictions from PDF files. Hi Kane, I glad to see you here.... I also read that post but as he mentioned a desktop software which remove restrictions from a file below 200kb if a free version is downloaded.Online tools come in handy if you have only few pdf's because it don't requires download and install.